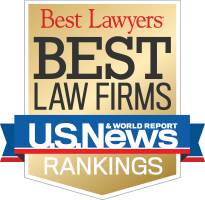 What makes a law firm eligible to receive a U.S. News – Best Lawyers® “Best Law Firms” ranking? Do the “Best Law Firms” rankings affect Best Lawyers traditional listings? On what criteria are the “Best Law Firms” rankings based? Are there any fees associated with participation in the submission process or receiving a ranking in “Best Law Firms”? Can I review a list of the practice areas included in the evaluation process? Where will the rankings be published? How can I receive communications regarding the submission process, announcements, and opportunities available to our law firm? What is the timeline for the “Best Law Firms” submission process? How may I publicize our firm’s rankings? To be eligible to participate in the “Best Law Firms” submission process, a firm must have at least one attorney who has received high enough peer review to be listed in the current edition of Best Lawyers. Firms are eligible in the practice area(s) and metro region(s) in which they have listed lawyers. To find out more about the nomination and selection process for Best Lawyers, please click here. Best Lawyers listings will continue to be compiled according to an annual peer-review survey. The “Best Law Firms” rankings are based on a combination of client feedback, information provided on the Law Firm Survey, the Law Firm Leaders Survey, and Best Lawyers peer review. No. There are no fees associated with submitting information or receiving a ranking. For a full list of the practice areas considered for the 2020 “Best Law Firms” rankings, please click here. On November 1, 2019, all of the rankings, in all tiers, will be published online at http://bestlawfirms.usnews.com. The National and Metro Tier 1 rankings will also be published in print in our Tenth Edition of "Best Law Firms". Law firms may designate a contact — or multiple contacts — to receive communications related to Best Lawyers and the “Best Law Firms” initiative. If we do not have a designated contact, all communications are sent to the listed Best Lawyers at the firm. Please contact your firm’s Legal Media Specialist or write to info@bestlawyers.com to be added as a contact for your firm. To view the timeline for our next edition, click here. Please view our publicizing guidelines by clicking here. For information on licensing the “Best Law Firms” badge, advertising, and other marketing opportunities, call 718-509-6095.